I read this article and found it very interesting, thought it might be something for you. The article is called Despite The Scams, India’s Healthcare Infrastructure Is Expanding and is located at https://archive.indiaspend.com/sectors/despite-the-scams-indias-healthcare-infrastructure-is-expanding-40435. Many people who had not heard of the Government of India’s National Rural Health Mission (NRHM) did so for the first time when the Central Bureau of Investigation (CBI) blew the lid off a Rs 10,000 crore NRHM procurement scam in Uttar Pradesh last year. While the scam, still being investigated, highlighted the weakness in implementing large Government-funded schemes, it also cast a shadow over the efficacy of nation-wide programmes such as NRHM. The Union Budget 2012 has nevertheless hiked the outlay for the NRHM by Rs 2,374 crore to Rs 18,515 crore (up 14%) as compared to last year. While it could be questioned whether this is throwing more good money after bad, IndiaSpend’s Sourjya Bhowmick studied the data for 2009-11 to conclude that for many of its failings, NRHM has added much needed physical and human infrastructure to serve India’s poor and ailing. The NRHM which was kicked off in 2005 is a flagship programme of the UPA. The objective was to provide effective healthcare to India’s rural population with a specific thrust on 18 ‘High Focus’ states like the North Eastern States, Bihar, Uttar Pradesh, Madhya Pradesh and a few others. NRHM aims to provide access to quality healthcare, facilitate convergence of various sectors, rejuvenate health infrastructure apart from creation of more personnel. The actual amount spent on NRHM in 2010-2011 was Rs 14,988 crore. The Budgeted amount for 2011-12 stood at Rs 16,141 crore, an increase of Rs 1,153 crore. The Revised Estimate for last year was Rs 15,497 crore indicating that Rs 644 crore remained unspent. This suggests that 96% of the funds allocated were utilised. 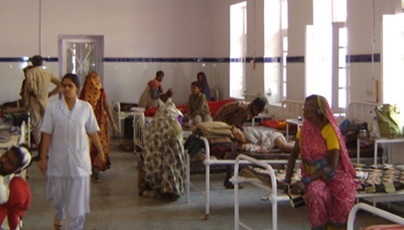 Incidentally, IndiaSpend earlier reported on NRHM’s struggles to fight the structural shortfalls in India’s healthcare. Now let us take a look at how NRHM performed in the last year, using figures from the Government’s Economic Survey for 2012. The Survey highlights a few important measures that were undertaken and completed last year. 18,272 Paramedics were added to the workforce. More Doctors, ANM’s and Staff Nurses were inducted into the workforce last year compared to its previous year. An important component of NRHM is the Accredited Social Health Activists (ASHA). An ASHA is primarily a woman of the same village/community who is trained and then employed to cater to a population of 1,000. Thus we can see a marked improvement in the selection rate, training rate of ASHA’s this year. It is clear that with the increase in expenditure results in better healthcare outcomes. A total of 16,338 health facilities were converted as 24*7 facilities which included PHC’s, Community Health Centre’s (CHC’s), Sub District facilities as on September, 2010. During 2011, the total number of Primary Health Centre’s which were 24*7 functional throughout the country was 8,333, which is a number more than half of the total number of various facilities converted last year . The table below gives us an idea of the additional increase this year when it comes to infrastructure and personnel. From the table above it is evident that there has been major increase in medical infrastructure, largely due to the increased expenditure and possibly better execution. At the same time 70 medical colleges were funded for upgradation as a part of scheme to upgrade Medical colleges with a onetime grant of Rs 1,350 crore which is shared on a basis of 75:25 by the Centre and the State. Another major milestone achieved this year is in leprosy eradication. The recorded prevalence of the disease has come down to 0.69 per 10,000 as on March, 2011. After years of efforts, which started in 1983, through the National Leprosy Eradication Programme, is highly successful. In the National Tuberculosis Control Programme, India has achieved 87% treatment success which abides by global targets for TB control. While there has been some progress in outcomes, the demand side is still growing. Even going by Census 2001 figures, India was still short of 20,486 Sub Centre’s, 4,477 PHC’s and 2,337 CHC’s. Meanwhile, Census 2011 is also out and health infrastructure demands will rise. India’s rural population, for instance, has grown by 90 million from Census 2001. Presently, 830 million Indians live in rural settings which translate into 69% of the total population of India. India’s healthcare journey is long and arduous but improved accountability and effective management of schemes like NRHM will do much for India’s rural poor.